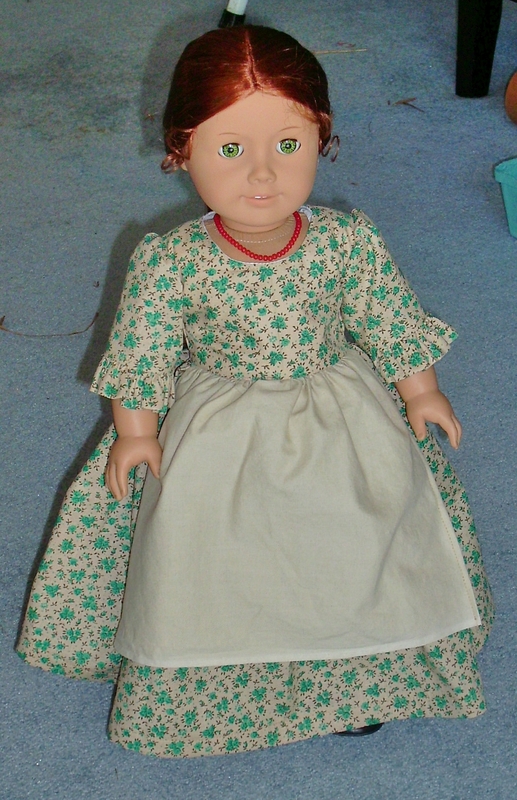 I wanted to be able to give a good review of the Heritage Doll Clothes book by Joan Hinds, so that meant at least making 2 different outfits from the book. 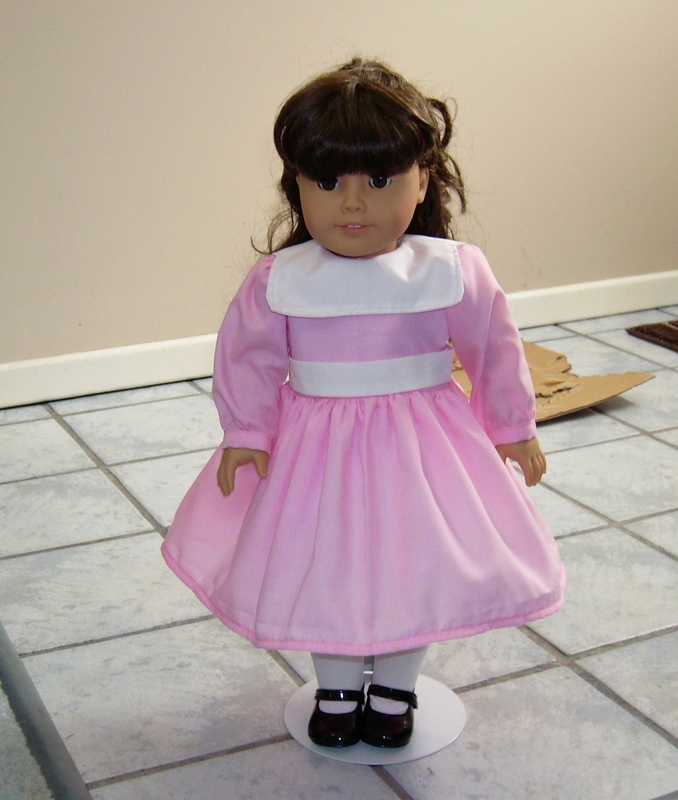 For the second outfit, I picked out the square collared party dress for Samantha. Here is my only complaint about the book. The fabric listed for the square collared party dress is silk. I feel that a silk party dress would be more appropriate for an adult collector like myself than a child. While silk may be time period appropriate, the clothing is still a toy that needs to be easy to care for. A silk dress is not something that you would throw in the washer and or dryer to clean. 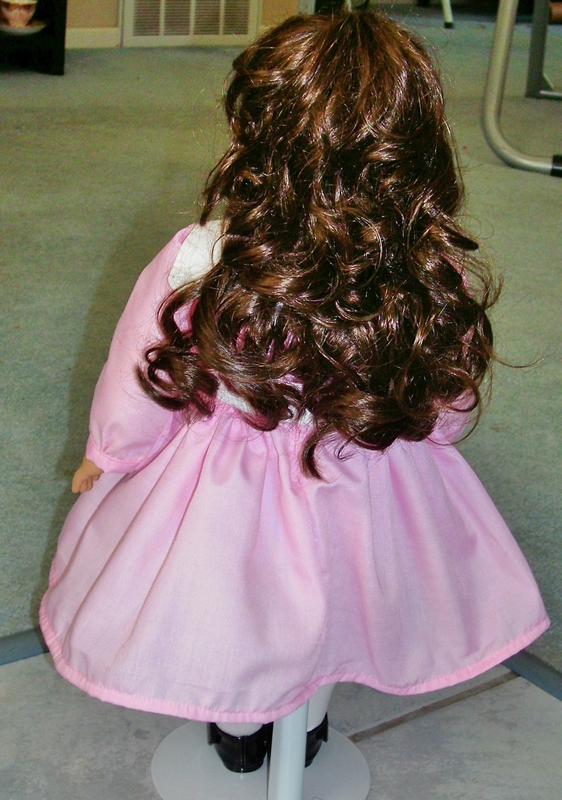 Plus, the main reason we all make doll clothes is to get a better quality item at a more affordable price. 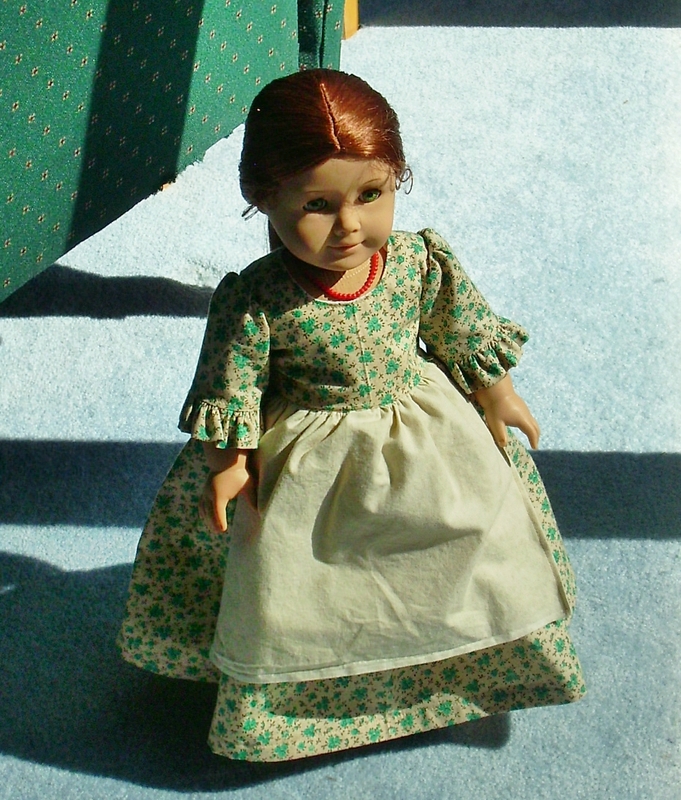 I know I have made my dolls a silk dress but it was left over fabric from the dress I made myself. I didn’t go purchase the fabric to especially make it. Instead of a silk party dress, I decided to go with a cotton play dress (a little more practicable and affordable). As a play dress, I decided that less ruffles and lace would be more play friendly. It may not be a time period correct idea, but at least I didn’t have to try to rummage through my trim box. The pink is a cotton remnant from Hancock most likely. If I had to guess, I think it would be a symphony broadcloth (it is fairly light weight). The white fabric is the left over white cotton I bought to line doll clothes with a long time ago. I don’t remember what it is. All the pieces went together easily and it was easy to sew. The only item I would suggest one to consider is the sleeve cuff. It was a little tight wiggling Samantha’s hand through. It is doable but a child may get frustrated that the dress isn’t easy to put on. If I did this again, I would consider putting in some Velcro at the bottom of the sleeve to make it slide easier over Samantha’s hand. The side seam would start about a half-inch to an inch above the bottom of sleeve cuff. If you have it, look at Pleasant Company’s Kirsten’s school dress for what I was thinking about. 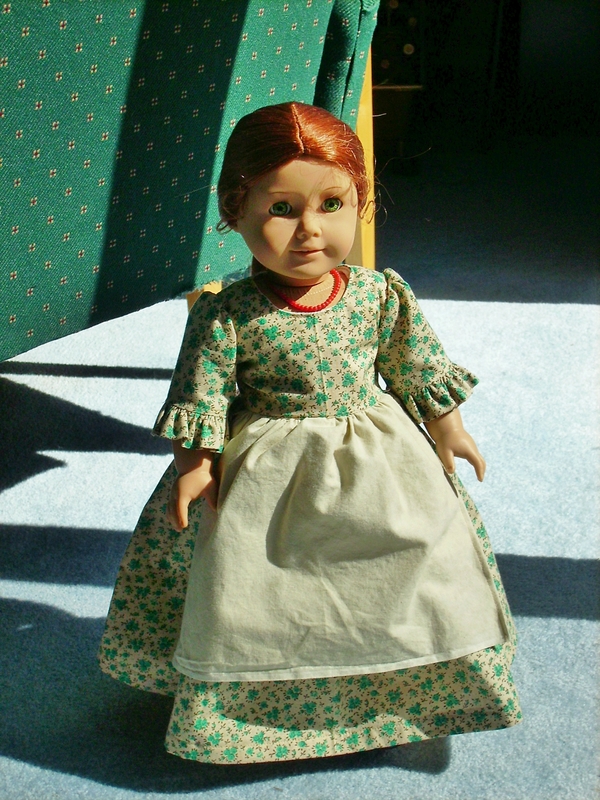 Today’s for Doll Clothing Week, it is furniture. Since I don’t really need doll furniture and don’t have anyone to give it to, I will get a jump-start on tomorrow’s theme of Free day with a two-part book review. 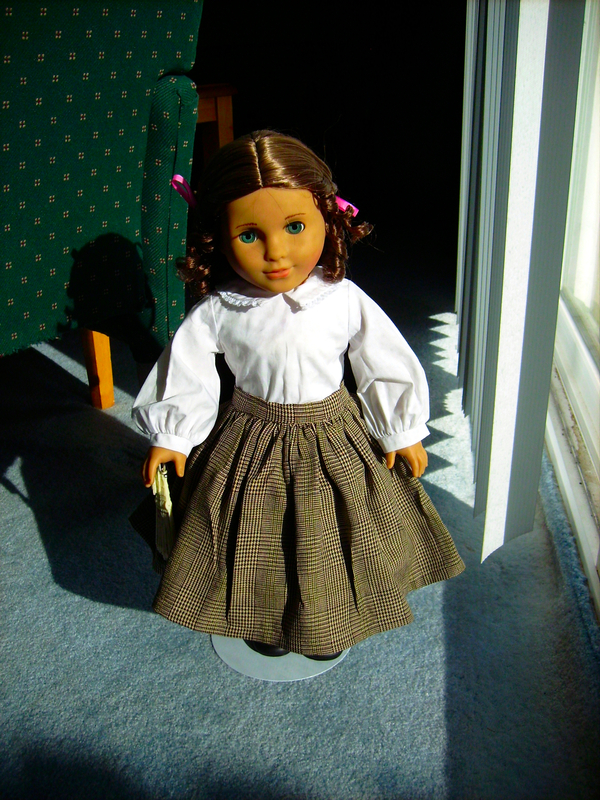 Several times at Joann’s, I would pass the book Heritage Doll Clothes by Joan Hinds sitting on the shelf. In the end, I decided to buy the book. The cashier at Joann’s deserves a big thank you because she told me about the 50% off coupon instead of using the 30% off coupon that came up first in the cell phone app. At first reading, I am wondering how new the book is. All I can see is a copyright date of 2015. But reading the “Getting Started” section, it mentions American Girl dolls by Pleasant Company as being the most popular. 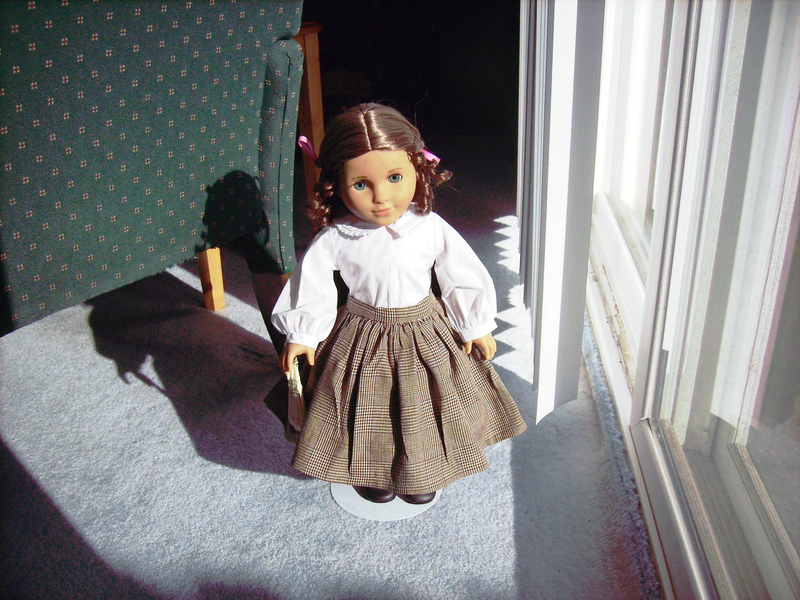 American Girl hasn’t been owned by Pleasant Company since 2000. So I think it is a re-release and was not sure if the original patterns were updated as they were converted to PDF or not. 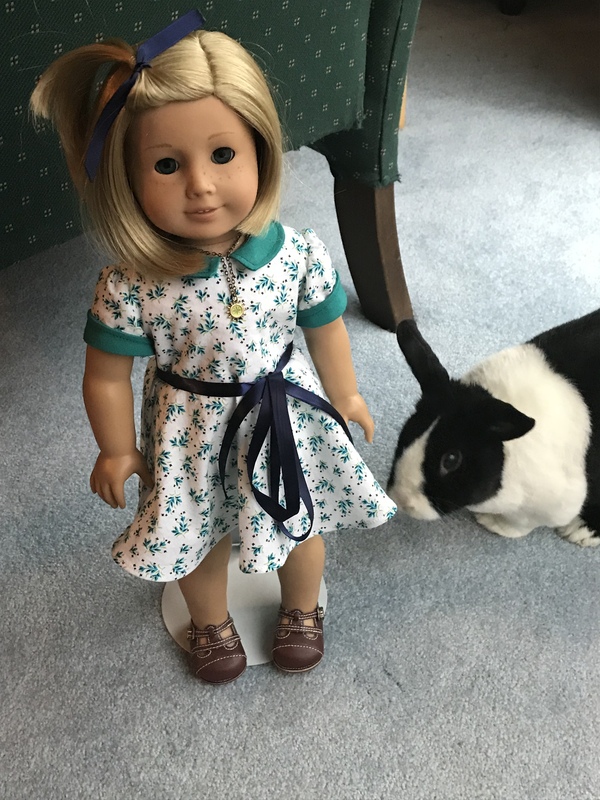 Just as a reminder, the older American Girl dolls are a bit more stuffed than the ones currently being sold. I honestly found it annoying that the CD’s paper case in the book was not perforated the best. It would not tear open along the perforations and I am afraid the CD will fall out now that there isn’t really any back flap to keep it in. I ended up buying a CD case at Micro Center to store my CD in. 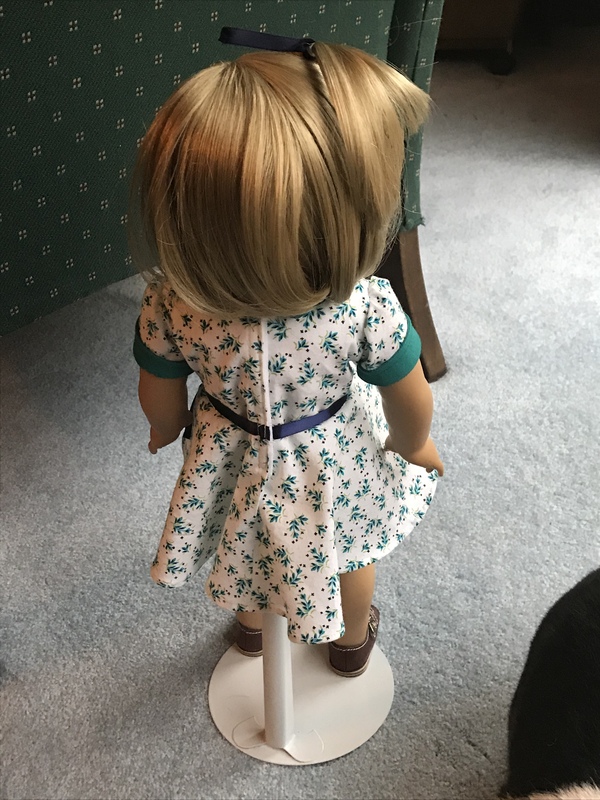 For this book review, I decided it was best to make a couple of the outfits and to show them on the newer and older dolls. Overall the book has 20 different outfits included. 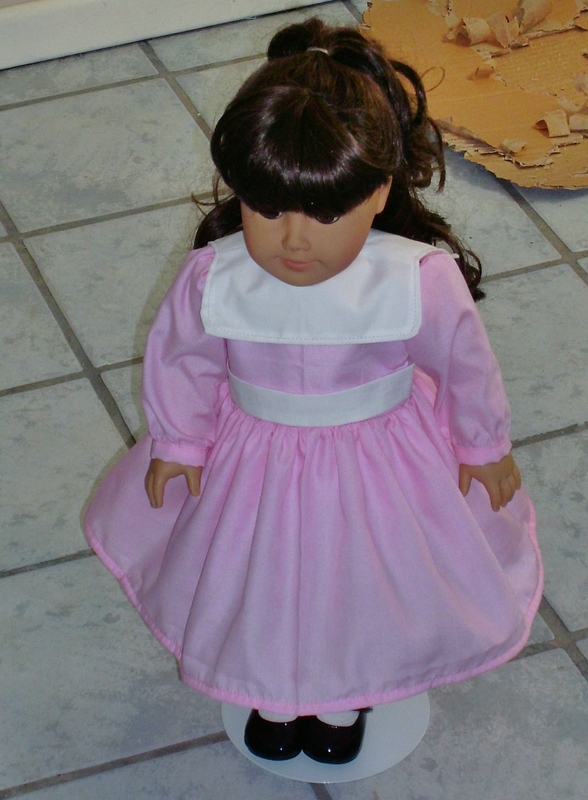 The patterns picked for the review include Square Collared party dress and the Colonial everyday dress. 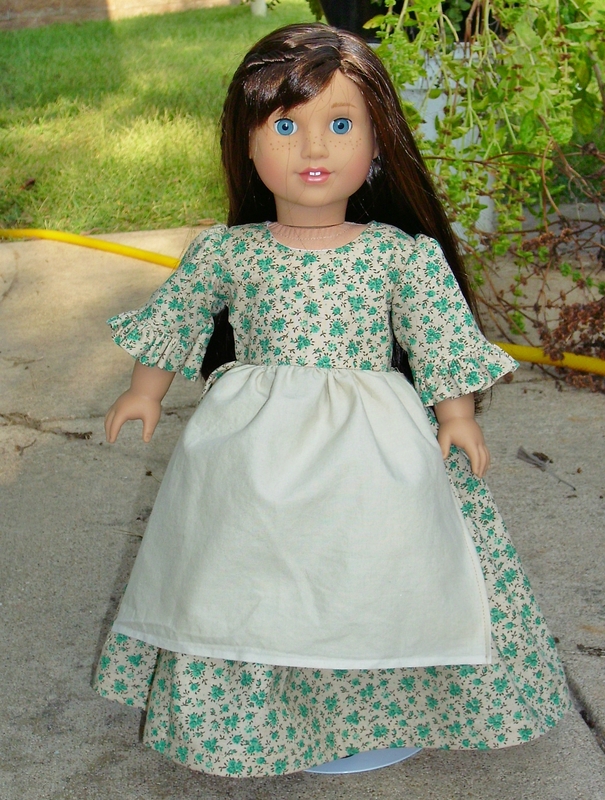 The Colonial everyday dress was first up. I chose a quilting cotton from my stash for the dress. 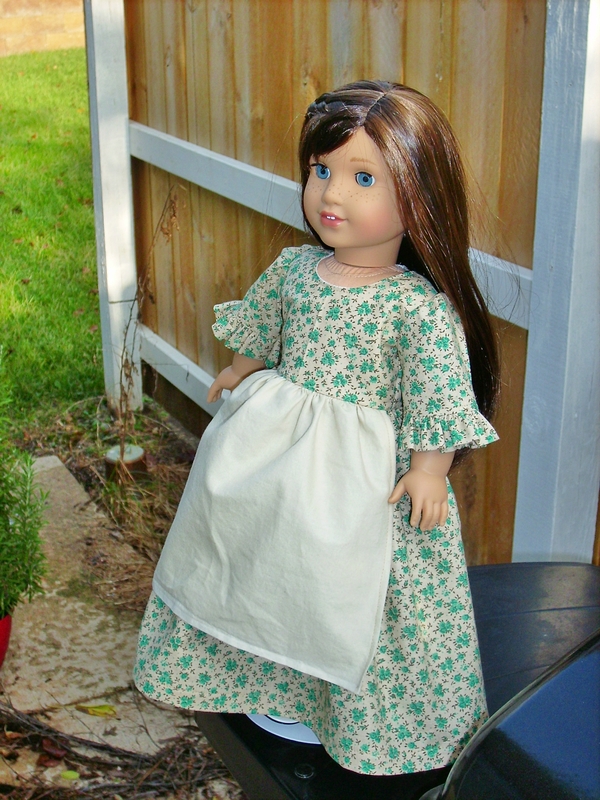 The apron, fichu and mob-cap are a plain cotton (probably quilting weight). As this is supposed to be an everyday in the house sort of dress, I didn’t use the lace for the neckline or bottom of the apron. 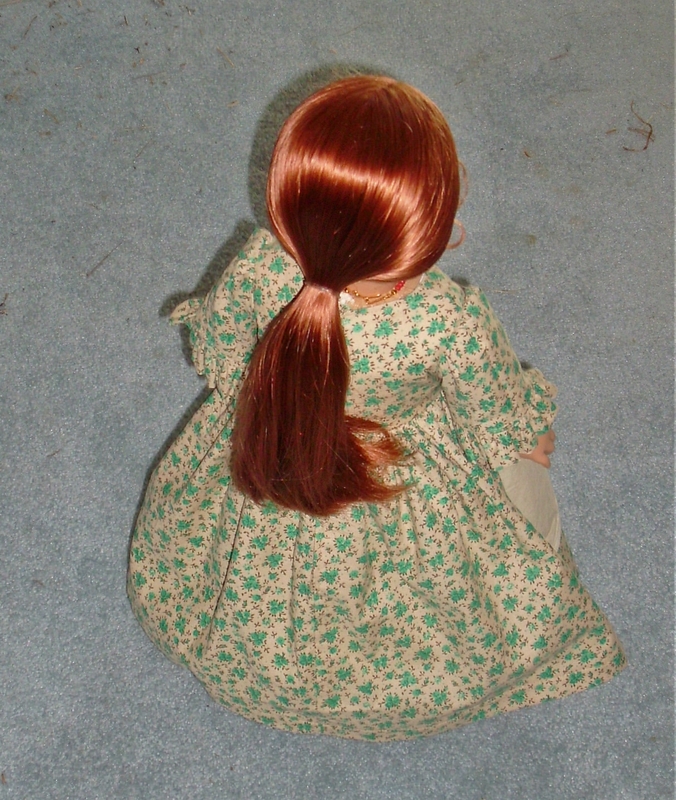 Seeing the dress on the doll, the lace at the neckline would have blocked Felicity’s lovely coral necklace. I really like that the fabric ruffles at the sleeve hem are self faced. It was nice not having to do a narrow hem on the ruffle (like what is requested on Felicity’s school dress from Pleasant Company). It does make that much easier to complete. The dress went together well and I didn’t have any troubles following the directions. I did go ahead and put this one Grace first to get an idea if the patterns were up-dated or not. Without era appropriate under garments, it was a little over a half-inch too big for her at the waist. I basically just pinched the fabric at her waistline and estimated amount. It doesn’t look like it is drowning her but does look a bit baggy. 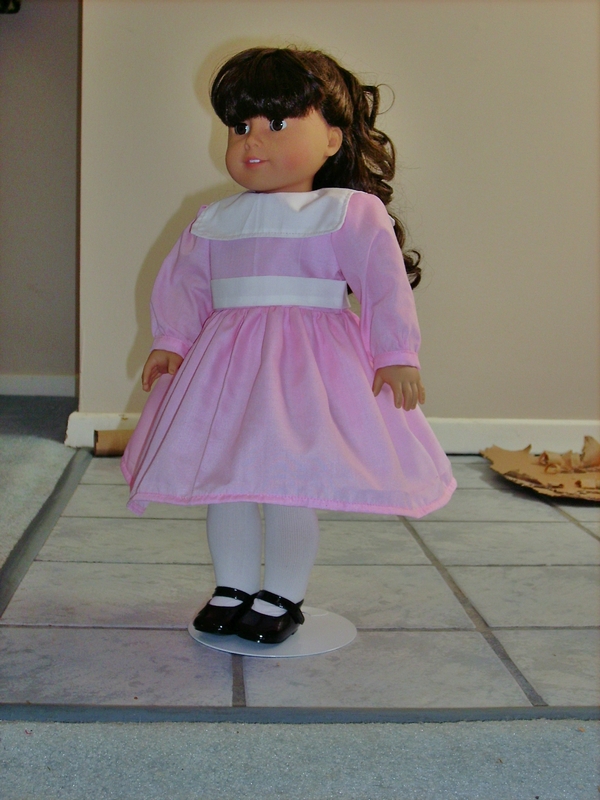 From my first pattern used, I don’t think the patterns were updated to follow more current doll dimensions. On Felicity, the dress fits better with just a little wearing ease at the waistline. Felicity does have on her original shift that came with her back in 1993-ish with the dress. Just remember that undergarments will affect the fit and decide if you want them or not.